So, these shoes. These giant shoes that I found hanging on a stop sign on Fabrication Avenue in Dallas. Goodness. Also, later that very same day, guess who I saw in concert? Bruce Cockburn. Did he play “The Gift” that night? Yes, he did. I love it when stuff like this happens. 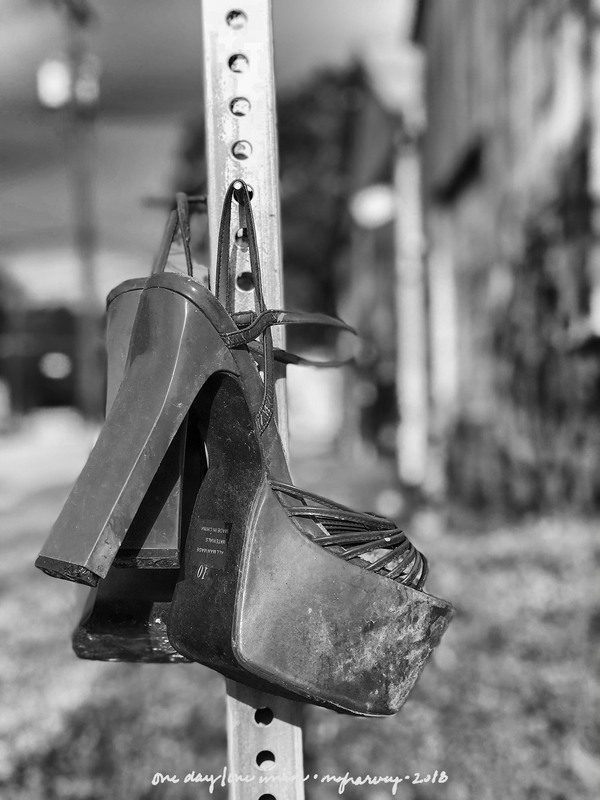 Posted on May 1, 2018, in Photography and tagged 365 photo project, black and white photography, bruce cockburn, learning to see, Leica, melinda green harvey, monochrome, one day one image, photo a day, photography, postaday, shoes, texas, thoughtful seeing, travel photography. Bookmark the permalink. 7 Comments. Silence is golden regarding those shoes. Good find as usual. There was a street-repair crew just arriving while I was there. The foreman came over and asked me what I knew about all the graffiti on the buildings, and he said, “I’m a little nervous to read it.” After I photographed these shoes, my Patient Spouse reported that almost all of the street crew used their phones to take pictures of the shoes. I felt bad for them – how were they to know that my example is not usually a good one to follow…! I know! I break some hips (mine, for sure, and probably someone else’s too) if I tried to walk in shoes like that. In fact, I nearly fall over just THINKING about it! I just learned this interesting fact – at high school proms around here, the girls wear the highest heels possible, but of course can’t walk in them all night, So there’s a “shoe check” that’ll keep their shoes until it’s time to leave. How about that? !